Puppies - any puppy - loves to play. And the boundless energy they often seem to possess needs to be channeled, or they are likely to become bored and understimulated, leading to destructive behavior. Add to that the fact that they are still learning about the new world all around them and any pet parent realizes the importance of finding great toys for them. However, with so many different toys available how do you make the right, responsible dog toy choices for your precious puppy? 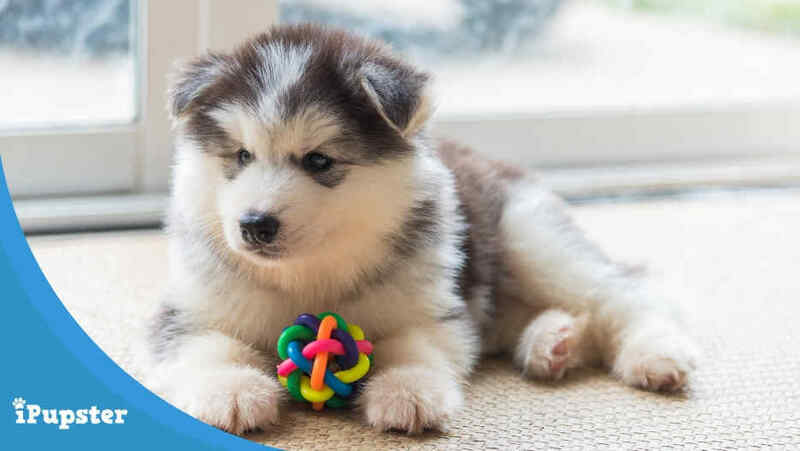 Here's a look at eight of the best-selling and best reviewed toys for puppies to give you some sensible shopping options. 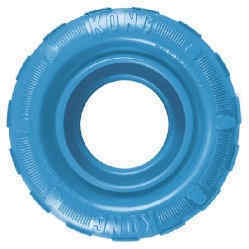 The Kong Puppy Tires Dog Toy is designed to tick as many of the boxes for what makes a great puppy toy as possible. It is perfectly sized for smaller mouths and durable enough to resist being damaged by sharp puppy teeth. It also teaches and encourages good chewing habits, teaching puppies what it is - and is not -OK to chew. At the same time, the tire tread like grooves help teething puppies soothe themselves while also making the toy easier for them to pick up and carry. And it's a blast for them to roll, toss and even begin to learn to fetch as a part of a game with their pet parent. Fans of this toy love the fact that it is very durable but not too hard and that it is easy for even young puppies to learn to move around. The fact that the 'inner tube' can be stuffed with treats is another popular feature, as figuring out just how to get those tasty treats out of their tire toy is a great way to exercise a puppy's growing brain, just like Major, a Boxer puppy so cutely demonstrates in the video below . 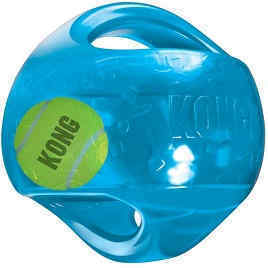 The KONG Jumbler Ball is a favorite with many pet parents of dogs of all ages, but it can be even more engaging and fun for a puppy to play with as it introduces many of the elements of the perfect puppy dog toy; its chewable, it can be used in fun games like fetch and it squeaks when manipulated in just the right way! The KONG Jumbler does not look much like a standard ball though. It has a handle on top, which makes it easy for puppies to grasp and carry, and a recessed bottom that gives it a slightly erratic bounce. Inside the larger ball is a smaller tennis ball - something that will really get a puppy's brain engaged as they try to figure out why it's there - and when that is tipped just the right way it makes a squeaking noise that should also help keep puppies engaged and amused. The KONG Jumbler Ball Dog Toy has garnered a lot of positive reviews from puppy pet parents online. They love the fact that the handle makes it easier for a puppy to learn how to fetch and carry a ball and that the 'ball within a ball' puzzle keeps them engaged and curious. Puppies need mental as well as physical stimulation and the former is exactly what the Outward Hound Hide-a- Squirrel Puzzle is designed to provide. This very cute looking toy consists of a plush 'log' that has openings (like woodpecker holes) that 'hide' plush, squeaky squirrels. The toy is available in several different sizes, from small to 'ginormous' to suit both small and large breed puppies and depending on size it comes with three to six squirrels. Puppy pet parent reactions to this interactive plush puppy toy are overwhelmingly positive. Puppies seem to love the challenge of retrieving the squirrels - which is helping to develop their reasoning skills - and many report that once retrieved the squirrels then become toys in themselves and are even used as nap buddies, something that puppies generally enjoy a lot and reviewers report their pups certainly do! 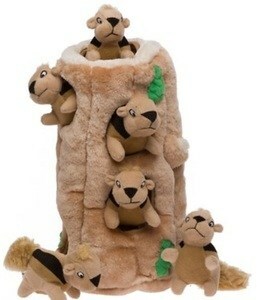 Enrich your puppy with hide-a-squirrel, he'll have a blast with this toy. Here's Moose, a Rottie puppy demonstrating this toy in action. Human babies have binkies, so why shouldn't a puppy? The KONG Puppy Binkie is designed especially for teething pups to help soothe their gums and provide them with comfort while also helping them to learn proper chewing behavior, something that will help prevent destructive chewing later on. The KONG Puppy Binkie really does look like a standard human baby binkie, just styled to fit a pup's mouth instead. It is crafted from a soft rubber that is designed to be soft on sore gums and new teeth and is available in several different bright colors. It can also be filled with a pup's favorite treats, or with peanut butter or doggie ice cream with ease. Pet parents who have purchased this rather unique teething puppy toy like it because it excites and engages their puppies and is durable without being too hard. Some also offer the tip that by placing the puppy binkie KONG in the freezer for a while and adding a 'lickable' treat it seems to become even more soothing for teething puppies to make use of. 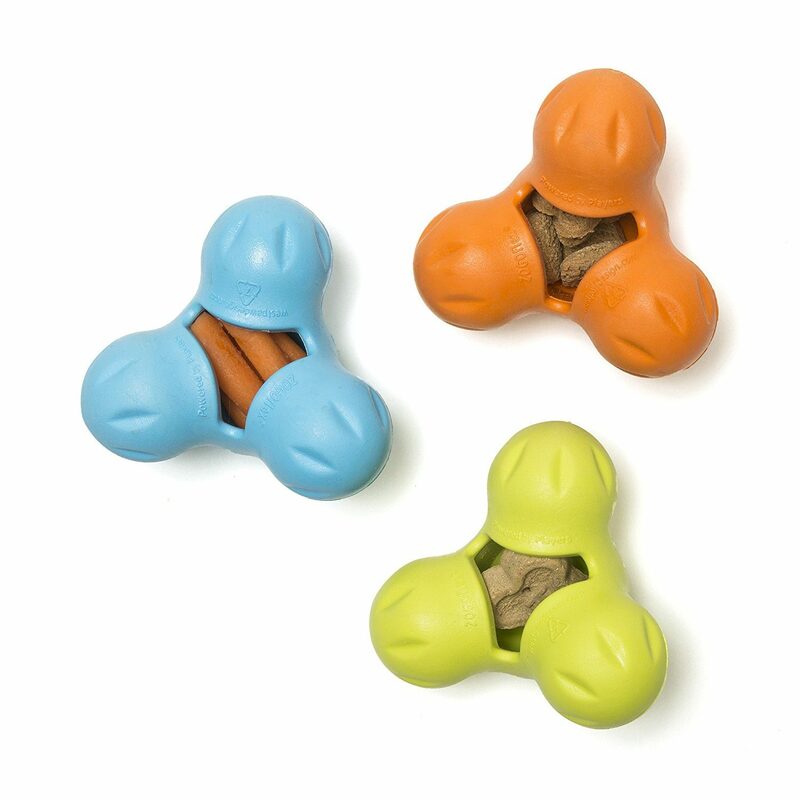 This trefoil shaped puppy toy is an engaging treat dispensing puzzle toy that provides just enough of a challenge for a puppy's developing brain without it being so hard that they become confused or frustrated. The toy is made using a material patented by the manufacturer called Zogoflex. This is designed to be extremely durable - and stand up to even power chewing puppies - while still being flexible and bouncy. Treats can be hidden inside to add a puzzle element to play and the toy is waterproof, so great for water play at the pool or at the beach. This is a great example of an interactive puppy toy designed to enrich your growing pup's intellect and provide endless hours of fun ( toy + treat = endless fun). . Positive online reviews from puppy parents who have purchased the toy in the past love it because it can be used in so many different ways. As a chew toy most report that it is indeed very tough and as a puzzle toy - when filled with treats - it offers an engaging mental challenge. Some puppy parents also report that it even works well as a solo play toy as pups can toss it around easily by themselves. ASB trainer Maggie Fahner shows a novel way to help keep your pup entertained for hours using the Tux, sweet potato and the irresistible KONG Stuff'N Easy Treat Peanut Butter. Early on, most puppies, if given the chance, enjoy chewing on a bone. But they have to be given with caution. Real bones can be a little too brittle and break off, causing a choking hazard. Some toy bones are simply too large for a young puppy's mouth and others a little too hard for their still developing teeth. 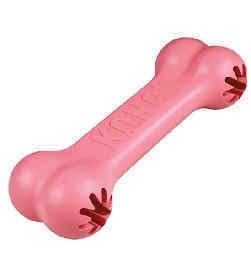 The KONG Goodie Bone toy is designed to be durable but soft and flexible, easier for smaller dogs and puppies to manipulate and durable enough to stand up to some heavy puppy chewing. And as it can also be stuffed with a puppy's favorite training treats it also offers an element of mental stimulation as well. Positive online reviews state that the bone is indeed very durable, able to stand up to heavy chewing puppies. Many also like the fact that the bone is lightweight enough to use in a game of fetch and that the treats dispense at a steady rate; not too quickly which could lead to a puppy eating to quickly but not so slowly that they become frustrated with the bone and end playtime because of that fact. Almost every puppy likes to have a stuffed cuddle companion in their toybox, to make use of as a nap buddy for self-comfort or to play a game of tug with their pet parent. Energetic puppies can however be rather hard on these toys and many do not last to long in the paws - and jaws - of an eager puppy. The Crazy Critters Racoon is a soft, but durable cuddle toy that lies long and flat and does not contain any stuffing that your puppy. It does, however, still feature a squeaker and also makes an engaging crinkling sound when chewed. It's longer torso makes it a great choice for games of fetch and its soft body makes it a great companion for sleepy puppies to cuddle with in their crate at night. Puppy parents who have purchased this toy say that it is indeed more durable than many other similar toys and that its flatter nature and longer length makes it great for a game of tug of war as well as fetch. As a cuddle toy it is popular too and even though some pups made short work of the squeaker as the toy remains intact it can still be played with under supervision and most puppies do not to seem to mind much that it no longer has a 'voice'. This is another racoon choice that a number of online reviewers feel is a great choice of cuddle toy for active puppies. It features minimal stuffing but does have a soft, plush 'pelt' that is comforting for young dogs to curl up with at nap time and then play with in a number of different ways once their 'batteries are recharged'. This cuddly critter also features a squeaker and its length makes it just right for a game of tug of war or a fun fetch and catch session. According to online reviews it is also very durable and stands up well to eager chewing puppies and rougher solo play sessions. Many also love the fact that its plush and warm and yet should an accident happen there is not too much messy stuffing to clean up. As we are sure you are aware the toys on our list are just a handful of the many that are available to choose from when shopping for the best toys for puppies on or offline. However many toys you encounter though there are some basic guidelines worth keeping in mind when choosing just the right ones. Also Read: What is the best food for puppies? What is best for a puppy to chew on? While lots of dogs like to chew- puppies do it a lot- not just to entertain themselves but also to try out their brand new teeth. And like a human baby they really do need ​teething chew toys to help soothe their sore gums as well. When choosing a chew toy for a puppy however always look for one that is softer, but as durable as possible, and if you choose one that also adds an element of engagement it is even more likely to appeal to your playful pup. Puppies are just beginning to figure out the whole coordination thing, but they do usually have boundless energy and will quickly become interested in the idea of a game of fetch with their pet parent. While it may take them a while to get the concept of actually bringing the toy they chase back it is a great way to help them learn new skills while also burning off some of that excess energy! The best fetch toys for puppies are usually those that are durable but lightweight and that are fairly easy for both puppies and humans to toss and retrieve. Bright colors are helpful too, as that makes them far easier to find if tossed a little too far. According to a number of research studies, collated in a piece published in Psychology Today, pet parents can actually change a puppy's brain physiology, making it larger and more efficient if they are providing with plenty of stimulating experiences. One way to provide these is to introduce puppies to challenging, but fun, puzzle toys toys early on. As is the case for human babies puppies do need to be supervised by their pet parents when playing with toys and the safety and suitability of those toys needs to be kept in mind at all times as they grow too. It's also important to watch carefully when they interact with other dogs, especially those that are bigger than them. Puppies are still developing their social skills and may be nervous around other dogs, or play a little too rough, leading to fights that could see them get unnecessarily hurt. When it comes to toys in general, initial play with any toy should always be supervised. Some eager puppies can destroy a toy very quickly, even one with a reputation for great durability, and a broken or damaged toy can quickly become a hazard. If a toy does break it should be removed immediately and only returned if you have examined it carefully and it's still safe to use.